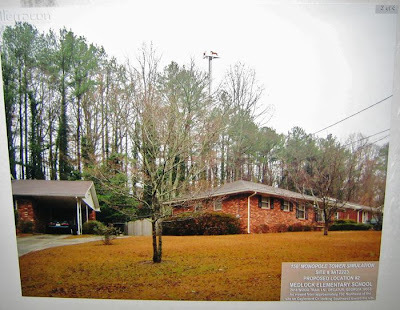 Medlock Area Neighborhood Association (MANA): DeKalb Co. School Board: Can you hear me now? DeKalb Co. School Board: Can you hear me now? The following recap/editorial of the May 11 meeting is not an official statement from the MANA board. It was volunteered by a long-time neighbor and MANA member. 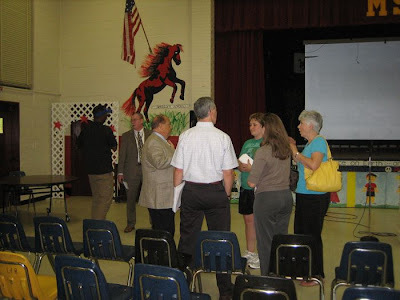 Representatives from T-Mobile; DeKalb Co. Board of Education member Donald McChesney (District 2 representative, which covers Medlock Elementary); and Steve Donahue (Executive Director of Plant Services, Dekalb Co. County Schools) were at hand on Wednesday evening to hear what the MANA community had to say about the proposed construction of a cell phone tower at Medlock Elementary. Close to 70 neighbors attended. 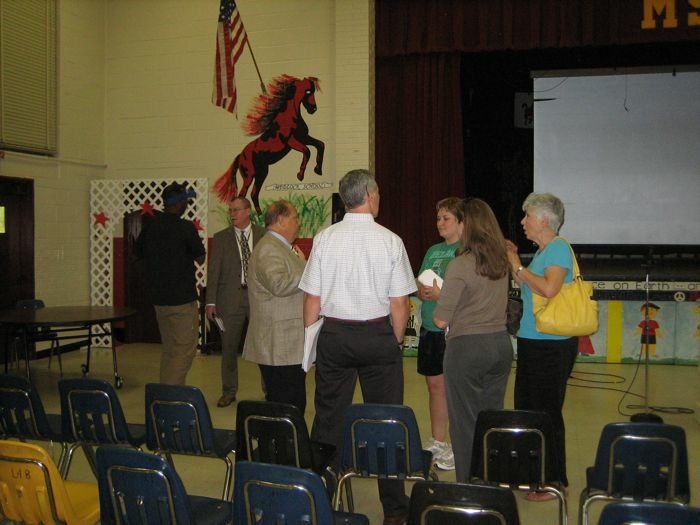 It was probably inevitable that community frustrations at the school closing would surface during the meeting. Audience members obviously wanted to convey (1) great dissatisfaction with how our elected officials (specifically, DeKalb Co., and the DeKalb Co. School System Board) are failing to communicate with one another, and (2) that our community feels willfully ignored as far as being consulted or even informed of decisions that affect our neighborhood. The MANA zoning committee chair, Theresa Same, made this point clearly when she reminded Mr. McChesney that news of these cell tower proposals came to us “through the grapevine” and not directly, even though MANA has actively sought involvement since its inception, and most certainly as soon as Medlock Elementary closing rumos surfaced. For example, MANA has spent the last several months fruitlessly trying to extract land use guidelines from the School Board, to better evaluate potential use for the property (as we have been asked to do) and solicit proposals that would avoid an abandoned building scenario. Audience members clarified there is no specific animosity towards T-Mobile (or any other cell phone provider for that matter). There is, however, great confusion about the timing of this proposal’s announcement and consideration. To wit: the school board will not unveil its 10-year plan until August. There are rumors of an ATT and T-Mobile merger, which could negate a need for T-Mobile towers in this area. 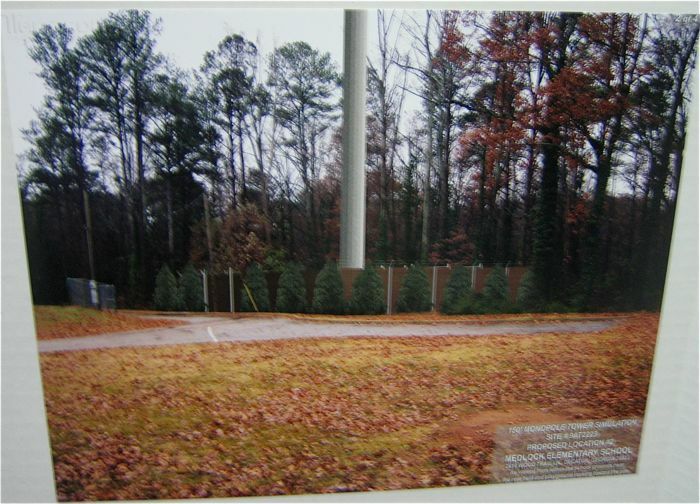 And, as stated by a T-Mobile representative, the DeKalb Co. School system is the only system in DeKalb Co. that will consider placing cell phone towers in its land (question marks and exclamation points bloomed above audience member heads at that statement…). With so many variables in flux, the only reasonable answer our community can issue to this proposal is a resounding NO. There were many highlights to the meeting, not the least being the obvious community pride and refusal to accept the format the County attempted to impose. As the meeting began, we were informed that we should spend 20 minutes reviewing the information stations in the back of the room. When the MANA audience refused, we were told this was not a democracy (let’s say that did not go over too well). Audience members asked for a compromise of taking 5 minutes to view the displays (since most had viewed them before the meeting began), and requested to have the T-Mobile reps come to the front of the room to either present information or answer questions. 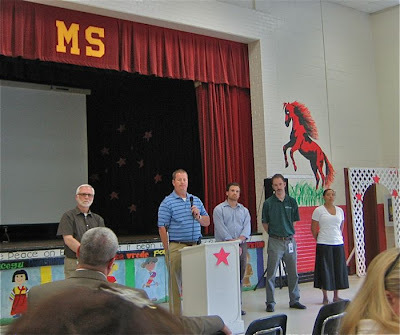 T-Mobile reps; Medlock Mustang wants answers. Now, with an audience-driven format, the questions poured forth. 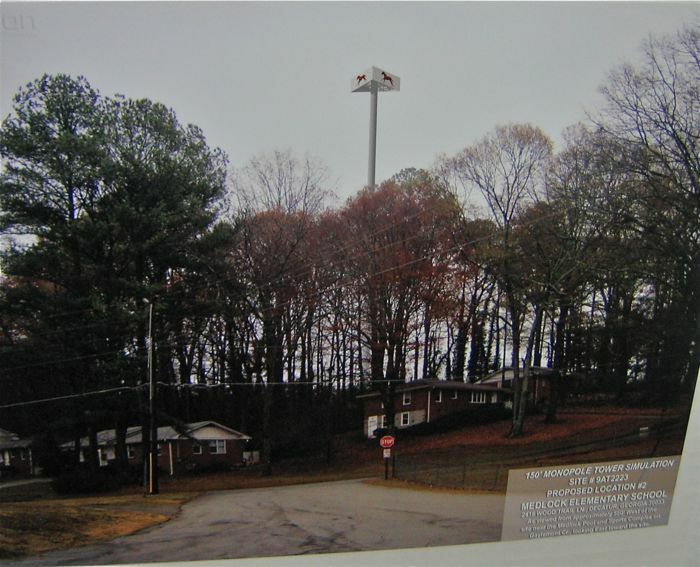 In Cobb County, more than 20 schools have towers, with each bringing in $150,000 every five years. Sixty percent goes to the school and the remainder going into a fund for schools without towers. The contracts are 15-year deals. But the school board in February voted to table indefinitely the construction of a T-Mobile cell tower at Compton Elementary after opposition from nearby homeowners. 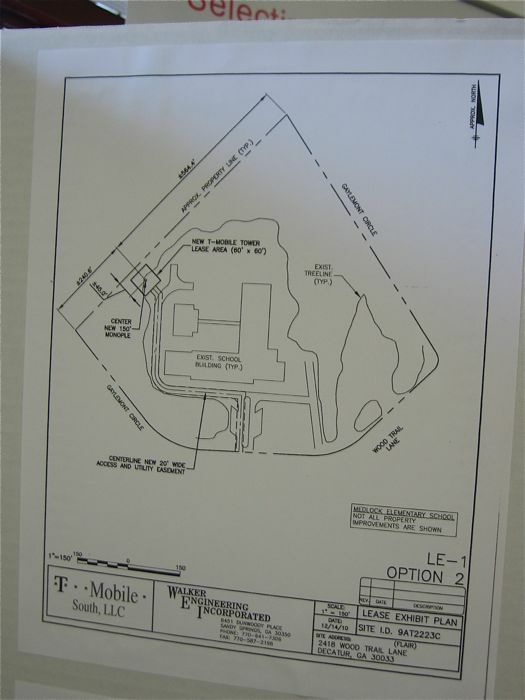 T-Mobile has presented DeKalb with several different lease options, which, over time, could generate from about $450,000 to $1 million per site, depending on the length and structure of the contract. The school's Parent Teacher Association could get a one-time payment of $25,000. The T-Mobile group appeared unaware that the school system closed Medlock Elementary… another example of questionable communication. Groans ensued when they informed us that the proposed tower would prominently feature the school mascot (a mustang… now sent to the glue factory). No answer was forthcoming as to how cell tower revenue would benefit our community, other than to improve T-Mobile’s ability to better serve its customers and generate income for the land owner. We were informed that the tower would be compatible with other carriers, and that contracts dictate that these structures be taken down should they cease to be operational. Mock-up photos show that the top of the tower (and its ghostly horse) would be clearly visible from any vintage point around the school (Gaylemont Circle and Wood Trail Lane). This is what the proposed tower would look from Medlock Park, pool side. Additional mock-ups of the tower's visual impact appear at the end of this post. Mr. McChesney injected a thread of intrigue by noting that Medlock “could” be the site of one of the 900-student schools that the county envisions. This statement was immediately challenged with the request that we table the discussion about cell towers until the school system unveils its Plan. T-Mobile reps reassured us about the safety of the tower’s output, stating that the strength of output is weaker than common in-house sources such as routers and baby monitors. They referred the audience to their website for reports that vouch that no deleterious short-term effects are documented. An audience member asked whether T-Mobile would need to file for a zoning variance; apparently no, as government-owned land is exempt from land use restrictions. Per our presenters, the County was approached with “multiple” requests for additional cell tower installations about a year ago. 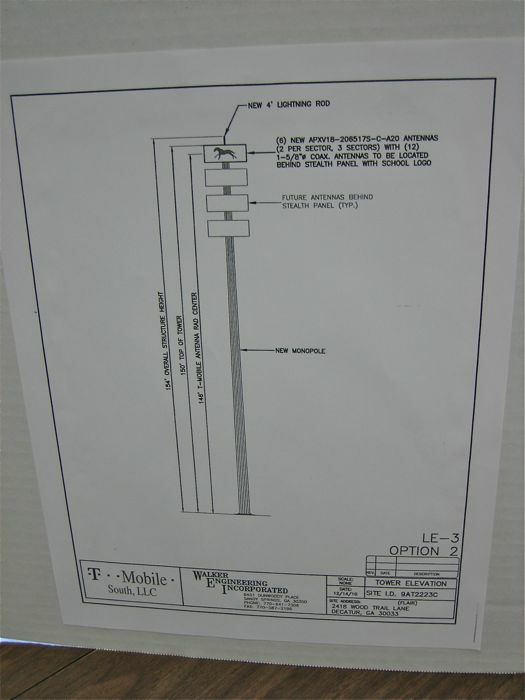 T-Mobile was the first to come through with a comprehensive proposal, about 8 weeks ago. 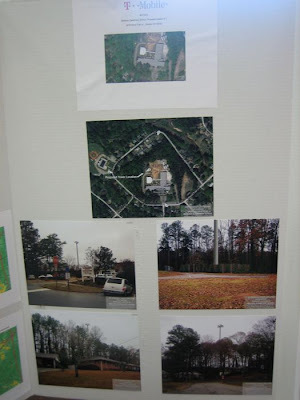 There were many questions about why T-Mobile would consider schools as cell tower sites. They explained that they study the area, first attempting to co-locate with existing towers and that building new towers (a quarter-million dollar endeavor) is a “last-ditch effort.” Audience members asked about using other spaces (non-residential) for said towers. The Zoning Chair offered to talk to T-Mobile about nearby commercial property that is currently underused or empty, and T-Mobile seemed receptive to exploring this angle. Following the meeting, Ms. Same and a T-Mobile rep reviewed the map and it appears that given the area's topography, multiple towers would be necessary to achieve the coverage that the school grounds tower would offer (due to the advantage provided by elevation). T-Mobile repeatedly stated that they do not wish to come into a space where they are not wanted, and that the audience should voice any concerns through their potential business partner, namely, the DeKalb County School System. 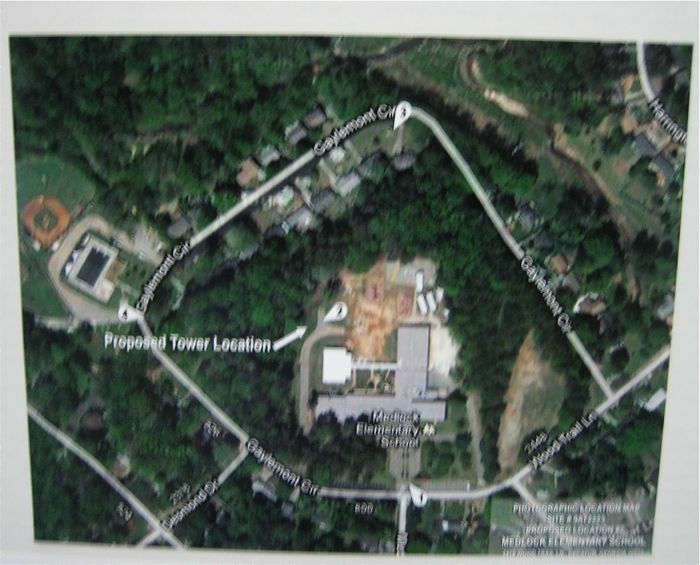 To this end, if you wish to convey your thoughts and concerns about the T-Mobile tower situation, or about other issues relating to the Medlock Elementary school closing and its current status, visit the Board of Education's website (http://www.dekalb.k12.ga.us/board-of-education). Perhaps a place to start is to note that, although the Board states its desire “to form a collaborative effort between school and home,” they should consider adding a 5th goal: that the Board (a) recognizes the pivotal bond that exists between a public school and the residential community within which it exists, and (b) seeks to cultivate transparent communication with all its stakeholders. 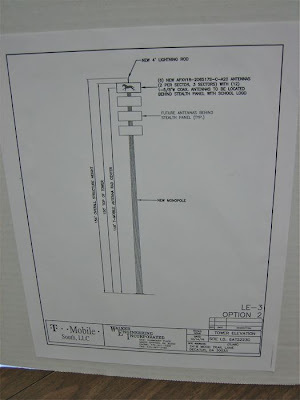 Proposed tower specifications. It would be 150 feet high. This illustration shows the corner of the school lot where the tower would be located (around 9 o'clock in this drawing). The space being leased involves a 60' x 60' footprint. Mockup of what the base of the tower would look like at ground level. View of Tower and its Ghostly Mustang, seen from the front of the school. The arrow marks the tower's proposed location. 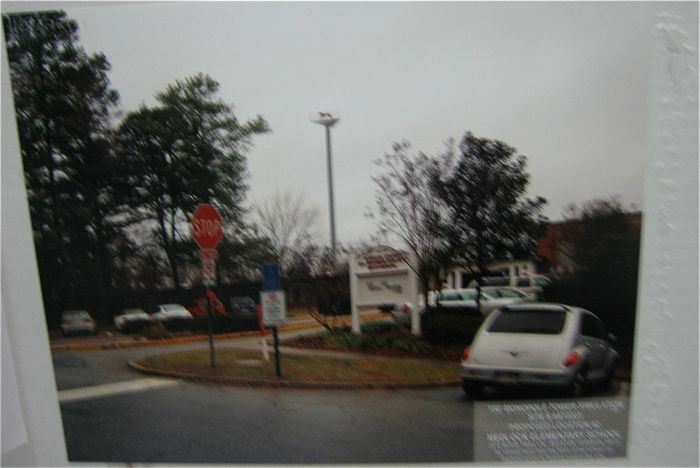 Tower's potential visual impact as seen from Gaylemont Circle.